The data-driven investing learning journey continues with a 360-degree look at the markets. 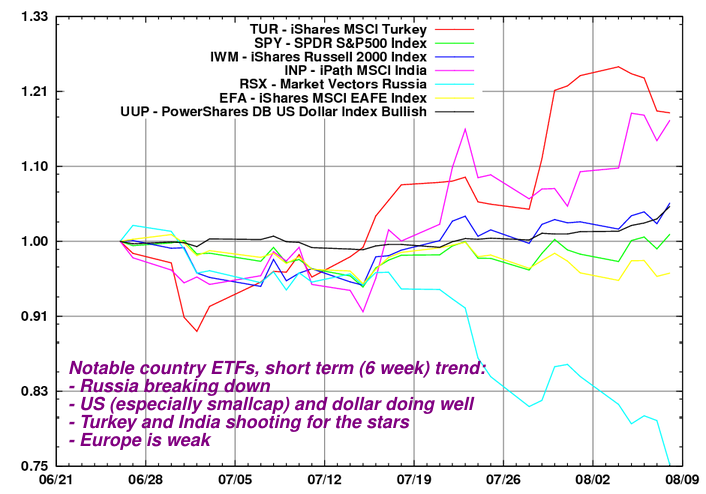 With the intermediate-term bottom on July 15 pretty much established (just like our timing model said just 2 trading days earlier) and with the breadth of the US markets showing pretty healthy signs for the short term, we go on looking for opportunities far and wide: regions, countries, sectors, even currencies. No, the big bad bear market isn't likely to be over just yet. How far further will it go? There's an attempt below to quantify when the long-term bottom will finally be established. It looks like we were about 2/3rds of the way there on July 31st, which is encouraging. On the weekend of July 12, I wrote about my experimental intermediate timing model and my belief that an intermediate market bottom is in the process of being established in US markets. My model's resolution is 1 week, since I train it on weekly data and since I don't believe I can get much more accurate than that anyway. The broad U.S. markets have bottomed on July 15th, just two trading days after the model signalled a bottom, and have by now printed a series of higher lows, and higher highs (chart below). Looking at the breadth picture, the advance decline lines are nicely up-trending, while the new high/low lines are still trending down (see chart below) but at a slower rate. This is due to the fact that the previous leaders (oil, materials, agribusiness) which were the ones making most of the new highs, are no longer making them while the rest of the stocks are so far away from 52-week highs that they are not likely to hit them anytime soon. This is ok, and actually healthy. I would focus on the Advance/Decline charts for now. I think this up-leg has some more room (a few more weeks, and possibly even more) to continue before the next bear-market leg down hits. I'll wait for a breadth deterioration before increasing broad-short exposure. To those who want to hedge earlier with a market neutral pair, I would be shorting Europe but only as a hedge to some equivalent or greater long US such as SPY. All of the leaders of the past few years: commodities, agribusiness, materials, and Oil are showing extreme weakness, even when compared to the broad indexes. Too many investors who were late to the commodity/oil party are still clinging to the hope these would come back. I'm not sure they will, and would advise to cut losses and dump those. There are much better places to be now than commodities/materials/energy. The amount of investment in alternative energy is growing and demand for oil is likely to slow even further with the worldwide slowdown and the conclusion of the Summer Olympics in China. I will not be surprised to see Oil below $100 by the fall. All the countries associated with commodities and energy Brazil, Canada, Australia, Russia are very weak too. I wouldn't be holding them. Looking at narrow sectors, the new leaders are all the "dead-cat" bouncers (Financials, Home builders, Retail, Consumer Discretionary etc.) which I wouldn't be tempted to buy with the exception of a really short (2-3 week) trade, and only on pullbacks. In addition there's a potentially longer term hope in new leaders that do not belong to the "dead-cat" category, like biotechnology, and healthcare. (chart below, pardon the density). Regions: Europe is very weak compared to the US. The thesis is that houses in places like the UK and Spain, for example, had a bubble very comparable in magnitude to the US, but have a lot more to fall than in the US, because real-estate prices in Europe have held-up much better than the US so far. The dollar is showing great resilience after the Fed has signalled the end of its interest cuts. Small cap is leading the broad asset classes, for the first time since mid 2007. This leadership started to assert itself before the July 15 bottom. This may be a significant change. The best country to be in right now is, surprise: the US. There are a few rockets like turkey (TUR) and India (INP) but they are so volatile and unpredictable that I would keep clear. India and Turkey are up 25-30% just a few weeks away from their recent bottom. As a rule: never chase parabolic movements except after a good pullback to the baseline. The worst of the worst is Russia, which is in what looks like a free-fall due to both the conflict in Georgia, and the free fall in oil/commodity prices. (chart below). By looking at the previous down leg: the ETFs that dropped the most are likely to be in the "dead-cat" category. Do regression analysis and separate alpha from beta. In general always look for high alphas, and low sigmas (high predictability/consistency). As for high betas you want them (with moderation) only in up-legs, and never during down-legs. Note that in the table below, all the short ETFs have negative betas as well as negative SPY correlations -- as expected -- since they tend to go down when markets are up like they did in the past 2 weeks. The top 2-week alphas right now are still dominated by utlra-shorts, although interestingly: regional banks (dead cats?) are also in the bunch. Tech/semis [See this insightful analysis of the NASDAQ stealth rally] and healthcare are, in my view, not in the dead-cat category, plus they have low sigmas, and thus are the most predictable and attractive Note: this data/analysis is for the short term only. I don't think that the bear market is over yet. Being an intermediate term timer, I try my best to ride the smaller waves, but comparative analysis tells me that after this leg up, we should have 1-2 more legs down before I can call a long term bottom. How much more we have to fall? The best method I have is comparative analysis. Since no two bear markets are exactly the same, we can try and find parallels we can use to map one to the other. One such parallel is investor psychology: despair vs. hope. In bear markets, as we have seen over and over, there are very strong rallies and some extreme up days reflecting investor hope that the bear may be over. 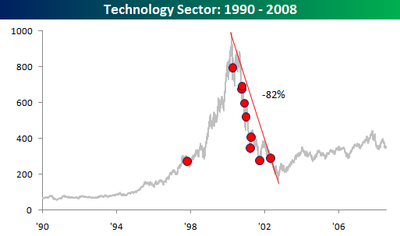 During the 2000-2002 bear market the tech sector crashed 82%. So far -- up to Jul 31 -- the financial sector was down about 42%. But we have to keep in mind, that the tech bubble was a bigger bubble at least as far as valuations are concerned, so how can we compare? What we can now do is see whether there's any correlation between these biggest up days, and what are the linear-regression coefficients between the two series. I did this and the comparison tells me that the ratio between the two vectors over the top 10 points is surprisingly strong (Pearson coefficient is 0.98): with a mean ratio of about 0.77 and a very small standard-deviation (0.0466). 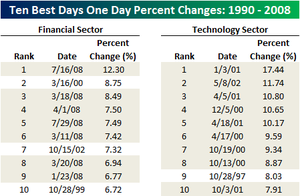 IOW: tech crash top 10 up-days were about 1.0/0.77 ~ 30% bigger on average than financials top 10 up-days so far. Applying the "Harry Seldon psychohistory device"
-82% * 0.77 = -63.14 % from their peak when they hit the long-term bottom. 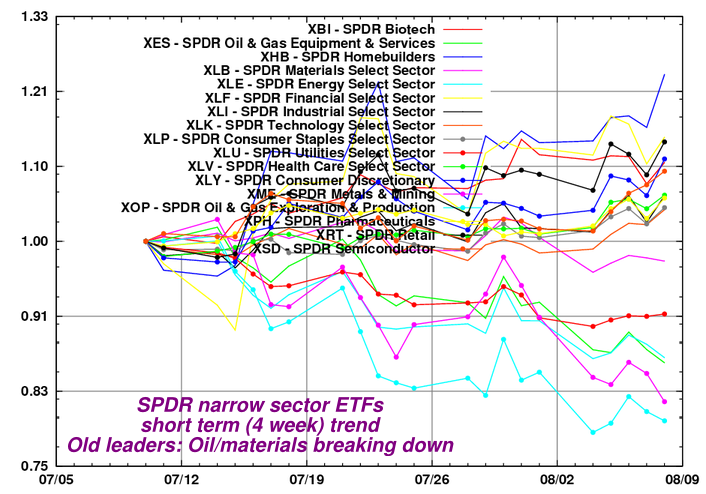 This means the bottom should be reached when (drum roll please...) XLF hits 14.04. 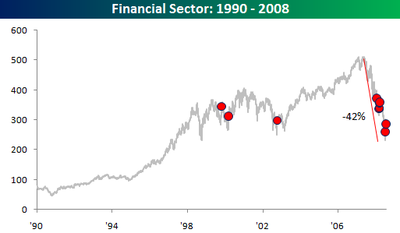 As of July 31, 2008 financials (XLF) were only -42% from their peak about 2/3 (0.66) of the way to 14.04 (and since then, they've rebounded pretty sharply). So even if we want to be optimistic, I believe we still have a way to go down till the final bottom in financials, in this bear market. Looking deeper: in the July 15 bottom XLF closed at 17.17. A bit above my target. 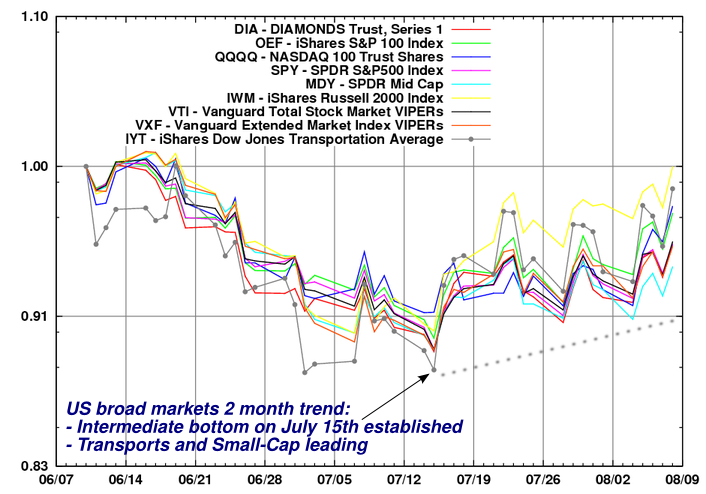 July 15 also had record volume (469M ETF units) which typically marks bottoms (both intermediate and long-term ones). However, we dont have to bet on financials exact bottom point. It is too risky to bet on one proposition. In bear markets, not all stocks bottom together. The new leaders of the next bull market should bottom well before financials do, and may even have already started their journey up. Note the extreme resilience of the Dow Transports and now, for the first time in many months, Small-Cap US stocks as well. I will keep updating readers in this space. Disclaimer: this should not be considered as investment advice. It is merely describing my own thoughts and actions. Disclosure: Long Dow Transports, US Small Cap, Technology, Biotechnology, Health-care. Planning to reduce beta and short Europe when breadth deteriorates and my intermediate market timing model flashes a top.